Upon successful completion, you will receive a Dance Ministry Master Certificate of License. You must complete Level 3 before going on to Level 4 (no matter what other experience or training you may have had). Level 4 must be done immediately after Level 3 completion. Both years must be done successively. This course is a continuation of Level 3. 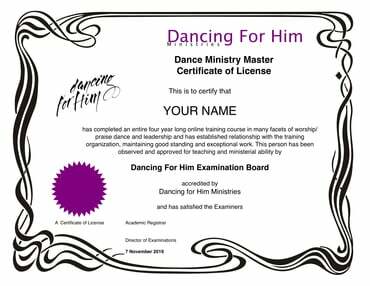 Those who desire to join the Dancing For Him Online School's Level 3 that begins January 10th, may make your initial pre-payment of $125 here and then subsequent payments in $100 increments before school begins.